Indigenous Director, Warwick Thornton (Samson & Delilah), is renowned for unflinching and uniquely Australian filmmaking. Sweet Country, released last week, is his second feature film and casts a visually stunning eye over the long shadow of race in Australian history. Inspired by real events, Sweet Country is Western set in 1929 just outside Alice Springs. The film follows Indigenous stockhand Sam Kelly (Hamilton Morris) after he kills the violent and abusive white landowner, Harry Marsh (Ewen Leslie) in self-defense. Kelly and his wife, Lizzie (Natassia Gorey-Furber), go on the run pursued by Sergeant Fletcher (Bryan Brown), who is determined to bring Sam to justice. Flashbacks and flash-forwards braid the narrative together and foreshadow menace. 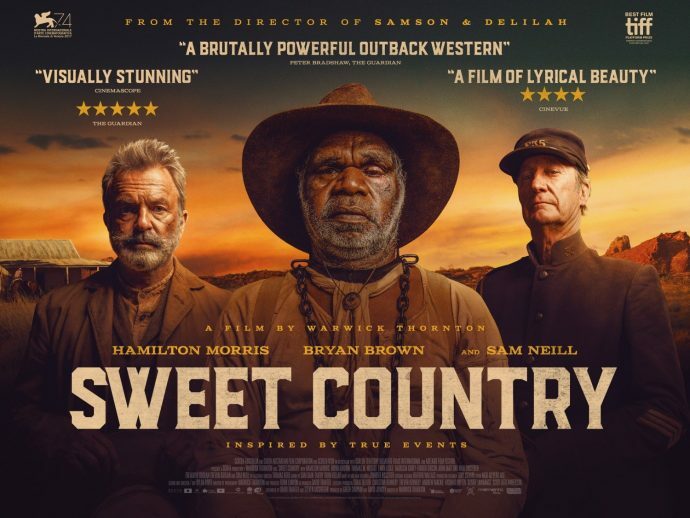 After premiering at the Venice Film Festival 2017, Sweet Country won the Special Jury Prize and the Critics’ Award for Best Film. In Toronto it was awarded the Platform Prize, and it is part of Sundance’s 2018 Official Selection. With an Indigenous cast of producers, directors, and scriptwriters, it also received Best Dramatic Feature at the imagineNATIVE Indigenous Film Festival. Such international acclaim is rare for an Australian film, and fair cause to pay it attention. Thornton presents an atypical Western. There are no decadent buildings or climatic shootouts. The macho escapism traditionally associated with cowboy films is swapped for a more reserved, pathetic masculinity in the male-dominated cast. Furthermore, it is a Western without justice; the courtroom scenes embarrass the futility of law, while the audience never truly believes that Sam will get the justice he deserves. In this film Thornton puts justice itself on trial. Sound design is an outstanding feature of Sweet Country. Devoid of music, cicadas and natural sounds form a minimalist score. Weighty gestures and pregnant pauses accompany laconic scripting, while violent scenes are silent. When dialogue increases during the courtroom scenes it merely impresses the futility and inability of words to reconcile divide. Thornton’s characters are full of complexity. Though some have bemoaned the lack of a single protagonist to straightforwardly guide responses, it is this quality that provides the film’s great success. Through complex and flawed characters – both indigenous and white – Thornton avoids nihilism and binary moral and social oppositions in his view on race. For example, it is clear that violent Harry Marsh whom Sam kills is suffering from PTSD as a result of fighting in World War One, a complexity that a lesser film would omit. The film’s greatest success, however, is cinematography. A gorgeous Australian pallet of ochre hues gives Sweet Country distinct visual identity. Composition is as minimalistic and stark as the outback itself. Thornton, who doubled as Director of Photography, uses light deftly, and the film’s most distressing scene occurs in complete darkness. 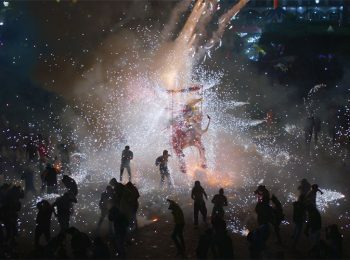 With only sound to indicate the narrative, Thornton plays on the audience’s own uncomfortable knowledge of the period to illuminate the action. The result is an insightful and daring film that confronts Australia’s uncomfortable history without laying blame. Admittedly a slow burn narrative, the film compensates with style and characterization, and subverts the dated dandyism of the Western genre. The timing of its release – just before Australia day – sharpens its historicism and finalizes its resonance with contemporary politics.